Philip Francis Nowlan Armageddon 2419 A.D. The original Buck Rogers novella from 1928! Mining engineer Anthony Rogers is trapped by a mine collapse and falls into a state of suspended animation due to the presence of radioactive gases. He awakens nearly five hundred years later, to a United States that has been conquered by the Chinese. Using his 20th-century military knowledge, he helps the down-trodden Americans take back their country. 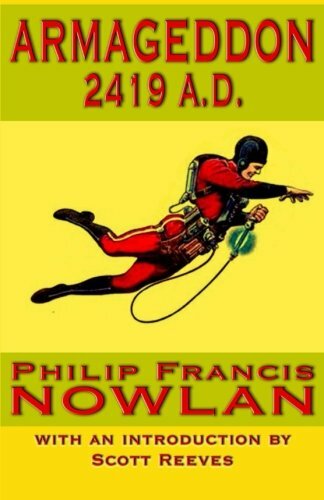 Philip Francis Nowlan (1888 - 1940) was an American science fiction author, best known as the creator of Buck Rogers. The character Buck Rogers first appeared in Nowlan's 1928 novella Armageddon 2419 A.D. as Anthony Rogers. The comic strip ran for over forty years and spun off a radio series, a 1939 movie serial and two television series. Nowlan also wrote several other novellas for the science fiction magazines as well as the posthumously published mystery, The Girl from Nowhere. 1. Armageddon 2419 A. D.